Have you run out of time and money? I feel like we have, and yet I keep thinking of a few more people that I'd love to give gifts to. If you are feeling the same way, here are a few gift ideas that don't require much time or material. You may even have the materials on hand. Let's take a trip through the blog archives and rediscover some quick crafts. The tortilla cozy will take you about an hour to whip up. It is great for anyone on your list that loves mexican food, or baked potatoes. 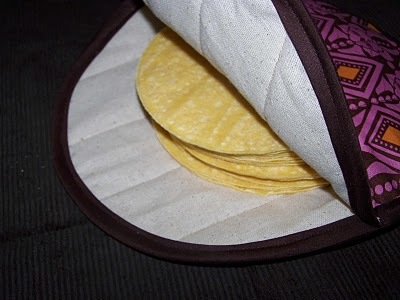 Just throw a stack of warmed tortillas in the cozy and it will keep them warm all through dinner. You can also put it directly into the microwave to heat your baked potatoes. This is a gift that can work for just about anyone. It would be a great teacher or school bus driver gift (probably a bit late for that though). Simply gather all of those free reusable shopping bags that you've collected, the ones with the store's logo plastered on the front. Find some scrap pieces of fabric that are large enough to cover the front panel, press under the raw edges, and stitch it to the front and back of the bag. Easy, practical, and inexpensive. 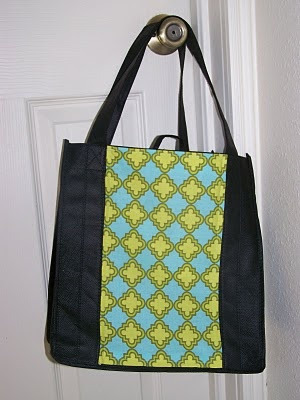 You could even stitch some Christmas print fabric on the front and use it as a gift bag. See the original post here. 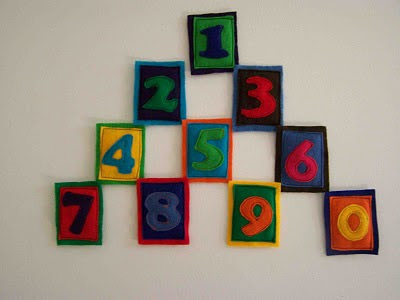 These magnetic shapes and numbers would make a great gift for any toddler or school age child. 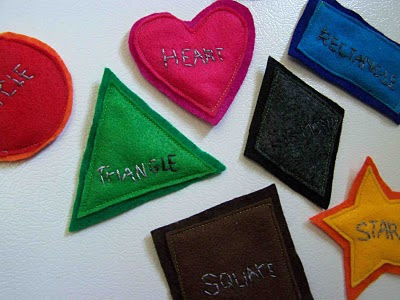 They are made using craft felt (inexpensive), and some small magnets. The magnets are encased in the fabric, so there's little risk of the magnets coming loose and being ingested. If you wanted to take a short cut in making these, you could use hot glue in attaching the felt, but I prefer sticking to the sewing machine. See the tutorial here. These chunky braided bracelets are made using strips of old t-shirts. They are easy to make, and comfortable to wear. You can find the full tutorial here. 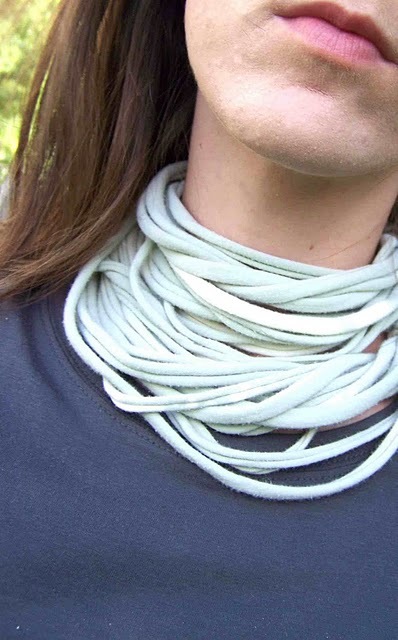 Since we've already started cutting apart our old t-shirts, why don't we make a trendy and warm scarf/necklush. All you need is a soft old t-shirt. This is a super quick and fun project. Find more information here. 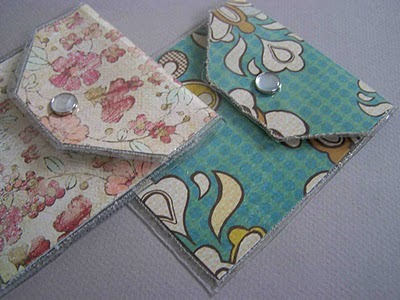 These paper and vinyl wallets can be made using an available paper on hand, maps, phone books, photos, scrapbooking paper, ect. The vinyl can be purchased for less than $3 a yard. Don't want to set in snaps? Use some adhesive velcro to make this project go really quickly. Find the tutorial here. 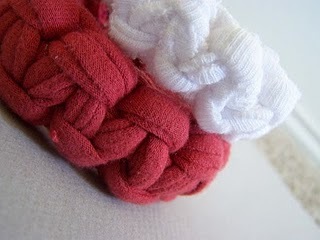 These elastic hairbands and headbands, are fun and easy to make. 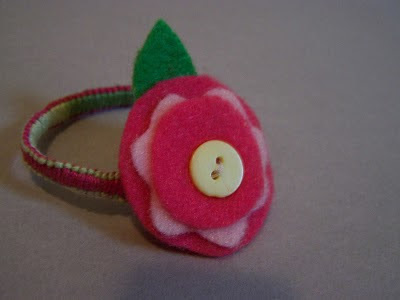 All you need is some oval elastic cord, embroidery or friendship bracelet floss, and some felt and a button. This would be a great project for any bored tweens in your home. Find more information here.